Baking in general can be a tricky thing. There’s a science to it- the ratios, temperatures, and type of ingredients you use matter a LOT. Try cooking with a cold egg when you’re supposed to use room temperature sometime, and you’ll see that it can make a big difference. So think of the technique involved when I was creating my banana bread recipe. I started out with this ultra-moist recipe from All Recipes, and went from there.. After TONS of experimentation, I finally got it just right. Just in time to get what felt like God-awful news- after some generalized pain, and a lot of stomach issues, I found out that gluten was the culprit. My banana bread baking days were done. Or so I thought. But just like that first time, I decided that I wouldn’t give up. 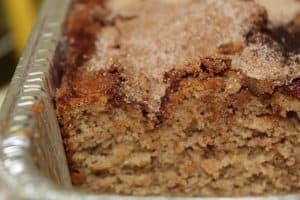 I set out to modify my banana bread recipe to create a Gluten Free version. And you guys? I NAILED it. Not only is this gluten free banana bread delicious, it’s yummy without disclaimers. Like, not “good for gluten free.” It’s just GOOD. And- because it’s FALL, y’all- I just had to give it a little pumpkin spice twist. 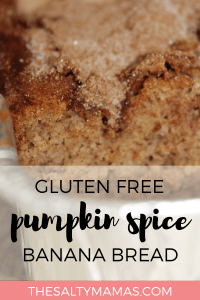 Check out the full details below for my Gluten Free Pumpkin Spice Banana Bread– we promise, you’re gonna love it. This post may contain affiliate links. You can read more at our legal page. Thanks for supporting The Salty Mamas! 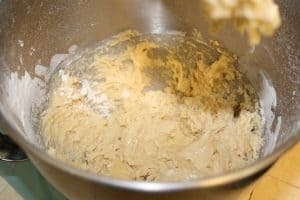 If you’ve ever floured a pan the old-school way (with butter and flour), this technique will be super familiar to you. First, you’ll rub the inside of the pan with butter or margarine. Next, add in a 1/4 cup of sugar and move the pan around until the entire pan has been coated with butter and sugar. 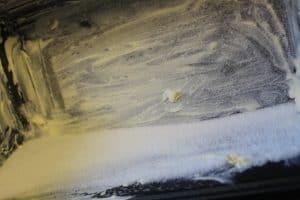 Melt your butter, and add it to a stand mixer or bowl along with a cup of white sugar. Cream together for a minute or so until creamy. Add in two eggs and a teaspoon of vanilla. Continue to mix until the new ingredients are creamed in. In a separate bowl, mix together the Gluten Free Flour (or regular if you’re not going for GF! ), baking soda, and salt. Then add in the pumpkin spice. If you’re a crazy PS fan, you may want to add in another half teaspoon or so. 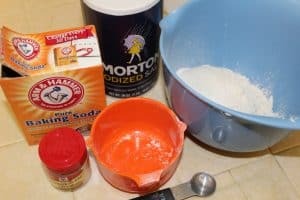 Turn on your mixer and slowly add in the dry ingredients. Mix until just combined. 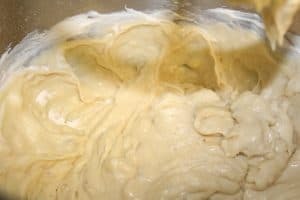 Don’t overdo it on the stirring- it’ll cause your bread to be more dense and less moist. Now you’ll throw in your over-ripe bananas and a bit of sour cream (that’s the secret to this bread ooey-gooey moisture). If you’re out of sour cream, plain or vanilla flavored Greek yogurt will work just fine as well. Now that your batter is complete, you’ll pour it into your prepared pan. We’re going to take the Pumpkin Spice factor one step further though, and TRUST ME- it makes all the difference. In a small bowl, combine 1/4 cup of white sugar with a tablespoon of pumpkin spice. 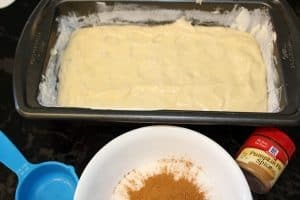 The result is similar to cinnamon sugar, which is what we use in the original banana bread recipe. It’s going to seem like too much, but leave it there- it’ll create this crackly, flavorful crust you’re going to love (and any excess will just fall off after slicing anyways). Slide your banana bread into an oven that’s been preheated to 350 degrees. Bake for one hour. Once you remove it from the oven, let your banana bread sit for about 15 minutes. To remove from the pan, I like to slice it first and then remove a few slices at a time. This helps prevent the crust from cracking off, like it would if you tried to turn the pan upside down to remove it. If you have any of your pumpkin spice banana bread left, you can wrap it in tinfoil and place it inside a Ziploc bag on your counter. It will last for about three days (but who are we kidding- it’s almost certain it’ll be all gobbled up by then, anyways). 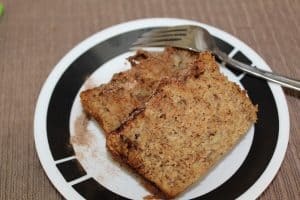 This Gluten Free Pumpkin Spice Banana Bread is PERFECT for fall. It's got moisture, flavor, and a scrumptious pumpkin spice crust. And the best part? It's so delicious, no one will even KNOW it's gluten free. Preheat oven to 350 degrees. You're going to cook your banana bread in a sugared pan. 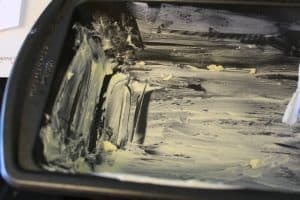 That means you'll first coat a 9x5 loaf pan with butter on the bottom and sides (I rub a stick of butter over it). Add 1/4 cup sugar to the bottom of the pan, and shake until it covers all of the butter. Make sure it covers the entire surface of the pan- this will keep your bread from sticking. 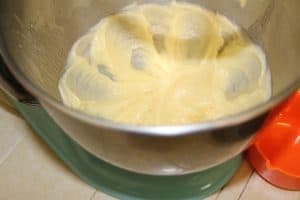 Using a stand mixer or hand mixer, cream together melted butter and sugar for 1-2 minutes. 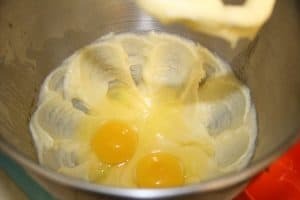 Add eggs and vanilla to your mixer. Blend until mixed. In a small bowl, add flour, salt, baking soda and pumpkin spice. Stir with a whisk until well combined. Slowly add your dry ingredients to your butter and sugar mixture. Mix until combined- do not over stir. Add in your sour cream (vanilla greek yogurt works just as well!) and your mashed bananas. Pour your batter into your sugared loaf pan. In a small bowl, combine the remaining 3/4 cup of sugar with a tablespoon of pumpkin spice. Pour this mixture over the top of your banana bread- it will still look dry (it may even look like too much!) but trust us- it will create a sugary, flaky crust you're going to LOVE. 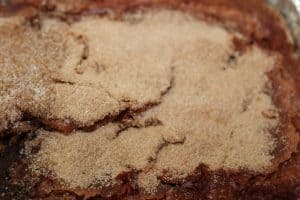 Cook your gluten free, pumpkin spice banana bread for 60 minutes. Allow to cool ten minutes in the pan before removing and slicing. Store by wrapping in tin foil and placing in a Ziploc bag. Bread will keep for 3-4days (if it doesn't get all eaten up before then, that is!). Tried it? Tell us how it went in the comments! And as always, you can find more Gluten Free Fabulousness in our GF Recipes board on Pinterest. Follow us there so you don’t miss a single tried-and-true recipe!